Gum treatments are vital for complete dental health, and at your favorite Missoula Dentist, Dr. David B. Duke performs remarkably gentle gum treatments to help fight gum disease and gingivitis. In order to prevent tooth loss caused by periodontal disease, Dr. Duke incorporates laser dentistry alongside traditional techniques such as scaling and planing for the most effective gum treatments available. Bitterroot Dental is a leader in laser dentistry because of his seamless incorporation of lasers as part of his contemporary approach to dentistry because they are extremely effective while minimizing the pain felt by patients who visit our clinic. Additionally, lasers provide great benefits for a number of gum treatments: lasers can help remove plaque without scraping which makes your visit less painful and more effective. 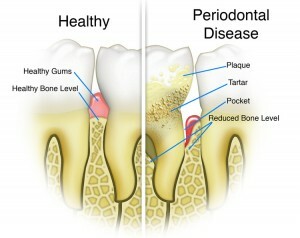 More than 75 percent of adults over age 35 have periodontal or gum disease. Periodontal disease is insidious. It is an infection of the gums that starts out as plaque, an opaque film on the teeth that hardens to form tartar. As tartar accumulates, it harbors bacteria that attack the soft tissue around the gums. This is the early stage of gum disease known as “gingivitis.” Left untreated, gingivitis becomes periodontitis which ultimately destroys the tissue surrounding your teeth and the bone that holds your teeth in place. Except for bad breath and gums that bleed, there are very few early warning signals. The disease advances silently, often without pain, and before you know it, you are losing your teeth and you don’t know why. Tooth loss is only the most obvious indicator of gum disease. Bleeding gums, puffy or red and purple gums, recession or loss of the scalloped part of the gum between the teeth are also characteristics of gum disease. Scientific research has discovered linkage between gum disease and stroke, heart disease, diabetes, cancer and provides pregnancy risks for women because when your gums become diseased, your entire immune system is weakened. Gum disease bacteria species are able to leave the mouth and travel throughout the entire body. In the past, fear of painful dental surgery has kept people with gum disease from seeking the care they needed. Well, those days are gone forever. With the use of saliva testing, lasers, mouthwashes, good home care and in office deep cleanings, surgery is becoming more uncommon unless care is sought too late or too infrequently. Gingivitis is a generative disease that left untreated, will cause significant tooth and gum deterioration. Just the word gingivitis can strike panic in a patient’s mind. The reality is that the treatment is simple and can be performed right in the nearest Missoula dentist office if you’re in a real need. Plaque and tarter that sits on the teeth provides an environment which allows bacteria to thrive and multiply. The bacteria then causes the gums to become inflamed and bleed. This condition becomes more noticeable when you brush your teeth or sometimes when you eat, but they’re only signs of the early stage of gingivitis. Gingivitis is easily treated by having the hygienist scale and polish the teeth. If gingivitis is left untreated, however, the condition will progress and the roots will need a planing. The difference between scaling and root planing is simple. Scaling is the removal of the dental tartar from the tooth surface, while root planing is the process of smoothing the root surfaces and removing the infected tooth structure entirely. 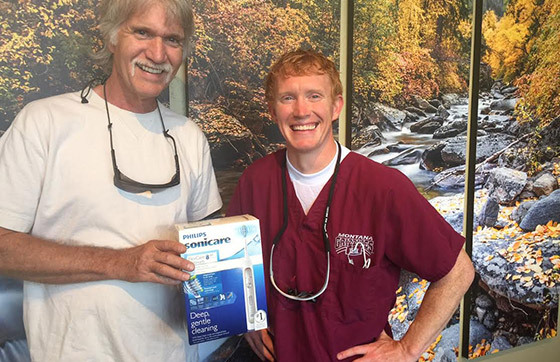 Scaling and root planing is not “just an expensive cleaning,” it is the cheapest and most comfortable procedure we can do to halt or slow your gum disease, improve your overall systemic health and save you mouth from tooth loss. Though, it’s a non-surgical procedure, scaling and planing may require anesthesia, depending on a patient’s pain tolerances and degree of gum disease. While the procedure is usually painless, advanced stages of gingivitis may make it necessary to numb the area for complete comfort. Deep scaling and root planing is usually broken down into one side of the mouth per appointment. This allows for adequate healing time, and reduces the time for each appointment. Unique to our office, we have the ability to combine traditional scaling and root planing and laser gum therapy for the most effective treatment available. In addition to the antibacterial properties of the laser, it also removes infected tissue while irrigating the pocket. It has a biostimulatory effect on the bone and gums, plus the Waterlase technology is the only technique that successfully regenerates bone without forcing you to go through surgery. People form their first impressions based on the appearance of your smile. There was a time when, unless you made a lot of money or were born with perfect teeth, you had to live with your smile. Today, a wide range of cosmetic procedures are available to the average citizen, at a cost they can afford. If you have a gummy smile or an uneven gum line, gingival recontouring is for you. Gingival recontouring (also called gingivectomy) sculpts the gum line so that it is even and in proportion to the amount of exposed tooth versus gum. This procedure removes the excess gum and exposes more of the tooth crown. If your gums have receded, and your teeth appear overly long or elongated, then soft tissue grafts can extend the gum line to create an aesthetic balance. The grafts also reduce the gum pockets that are prone to future periodontal disease. If you are unhappy with your current smile, let us help. Give us a call to discuss your options. Sometimes the effects of periodontal disease create permanent changes in the tooth and gum structure that will cause issues in the future. Enlarged gum pockets between the tooth and the gum line are common after having advanced gum disease. Sometimes these gaps are cosmetic in nature, affecting only the appearance of the gums. More commonly, the gaps put the teeth at future risk for tooth and gum disease because they harbor plaque-forming bacteria. Pocket reduction surgery is designed to eliminate these areas the bacteria can hide, thereby thwarting the after effects of periodontal disease and restore your mouth to a healthy state. The goal of periodontal surgery is to gain access to the tooth root and to clean the damaged areas. Once we can visually see the damage, it can be removed. Osseous surgery involves reshaping the bone around the tooth to a more flat surface, thus removing the pocket the bacteria were once living in. Depending on the degree of reshaping needed, Dr. Duke may choose traditional surgical techniques or more conservative laser use. With laser surgery, patients feel minimal discomfort and heal faster, sometimes without the need for sutures. 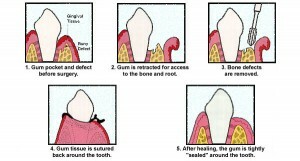 In traditional surgery, the gums are moved and the bone reshaped. The gums are sutured back in place. 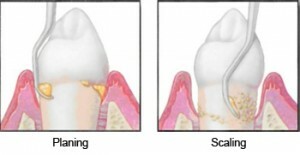 Often, osseous surgery is combined with bone grafting techniques to protect the exposed roots of the tooth. Occasionally, the gum returns to its original position, but the bony pocket is removed. The pocket requires more frequent cleanings to maintain the healthy gum-bone relationship. Osseous surgery is a procedure that reshapes the bone which holds your teeth in place. Osseous surgery commonly treats periodontitis. Patients with periodontitis experience defects in the bone around their teeth. The osseous surgery removes those defects. Prior to the surgery, the patient undergoes a periodontal treatment that consists of scaling and root planing. A local anesthetic is administered to minimize the pain. Once the roots are cleaned, Dr Duke uses a laser to reshape the bone surrounding the teeth. Depending on the extent of the defects, the deformed bone is removed, and the rest is shaped. Bone grafting material is used where the defects are too large to be treated with only reshaping. 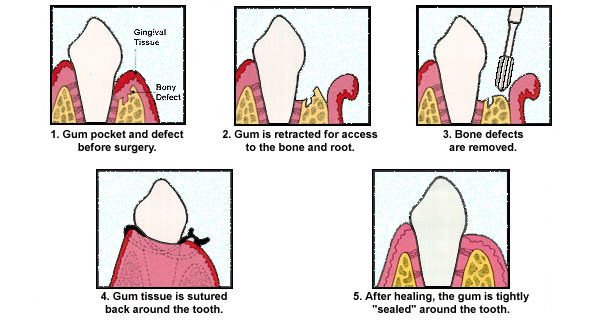 Once the bones are back to their original state, the gums are sutured back into place. Osseous recontouring and grafting is a routine procedure, with a high success rate. A biopsy is simply the removal of a tissue sample to determine if it is diseases. In dentistry, soft tissue and bone are sent for biopsy. The role of a biopsy is to diagnose oral cancer. If we suspect a tissue may be cancerous or pre-cancerous, we will recommend a biopsy be performed. The collected sample is sent to a lab for identification. Results are usually returned within 72 hours. In all but the most difficult cases, Dr. Duke will perform the biopsy. Depending on the location, he can frequently do this without a shot using the Waterlase laser. The Waterlase leaves no sutures, no bleeding, minimal discomfort following the procedure and faster healing times. Loose teeth are uncomfortable, especially when you try to eat food or chew gum. Teeth become loose because periodontal diseases causes a loss of bone around the tooth, injury, orthodontic treatment, or pressure caused by tooth misalignment. 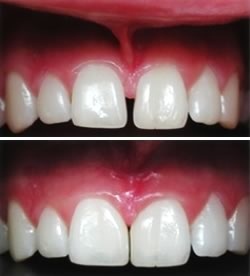 A new technique called periodontal splinting attaches weak teeth together, turning them into a single unit that is stable and stronger than the single teeth by themselves. The procedure is most commonly performed on the front teeth. The procedure is as simple as using composite material to attach, or splint, the loose teeth to the adjoining stable teeth. Tooth splinting is a common procedure that has gained popularity due to its effectiveness. A frenulum is a piece of tissue that prevents an organ from moving. There is a frenulum that attaches your upper lip to the gums, while another connects the lower lip to the gums. A frenulum that is too short or thick, will cause problems in speech patterns and tooth misalignment (for example, the top front teeth may have a gap between them that does not close). In infants, a shortened frenulum underneath the tongue will inhibit breastfeeding. When the frenulum disrupts movement, growth, or development, corrective action is necessary to resolve the situation. A frenectomy is a minor surgical procedure that is performed in our office. It can be performed with either a scalpel or laser and takes less than 15 minutes. Using a laser causes very little or no bleeding and does not require stitches. A laser also results in less postoperative discomfort and a shorter healing time. While infants may require general anesthesia for the procedure, children and adults can have the procedure performed using local anesthesia. Most often, Dr. Duke is able to perform a frenectomy without any shots, using a topical numbing gel and the laser. If your child needs a frenectomy, there is nothing to worry about. The procedure is very successful and causes minimal discomfort. Most children return to school the same day.